The two main types of diabetes, type 1 and type 2, are very different in their onset but very similar in their qualities of destruction. Diabetes is a serious condition, which can lead to blindness, kidney failure, heart disease, stroke and nerve damage that can cause amputation. However, thanks to breakthroughs that can help prevent and manage both types of diabetes, the destruction can be impeded, slowed down and even stopped. Type 1 diabetes often runs in families and develops most often in children and young adults but can appear at any age. Type 1 diabetes accounts for about 5 to 10 percent of diagnosed diabetes in the United States, affecting two out of every 1,000 Americans. An autoimmune disease, type 1 results when the body’s system for fighting infection (the immune system) turns against a part of the body. In diabetes, the immune system attacks and destroys the insulin-producing beta cells in the pancreas, and it then produces little or no insulin. A person who has type 1 diabetes must take insulin daily to live. If not diagnosed and treated with insulin, a person with type 1 diabetes can lapse into a life-threatening diabetic coma, also known as diabetic ketoacidosis. Researchers report that one way to help prevent this disease from manifesting in babies is to introduce cereal into their diet at the appropriate age - between four to six months. Studies of at-risk children who were fed fiber or rice cereals before they reached the recommended age of four months were four to five times more likely to develop an autoimmune response that destroys islet cells in the pancreas than babies introduced to cereal between four and six months. There are various theories about why fiber and rice cereals might trigger cell destruction in the pancreas in infants at risk of diabetes, according to a recent report in the Journal of American Medicine Association. One theory is that the immature infant's gut reacts to the gluten in cereal with an excessive immune system response. In older infants with bigger appetites, the trigger may be the body's response to the larger amounts of cereal consumed. Another theory posed is that infants who not fed cereal during the critical developmental stage between four and six months lack key nutrients such as vitamin E and zinc, which causes the immune system to overreact. Today, for both children and adults, healthy eating, physical activity, and taking insulin are the basic therapies for type 1 diabetes. The amount of insulin must be balanced with food intake and daily activities. Blood glucose levels must be closely monitored through frequent blood glucose checking and blood glucose levels are monitored several times a year with a laboratory test called the A1C and the results reflect the average blood glucose over a two- to three-month period. In people with type 2 diabetes, the pancreas does not produce enough insulin, a hormone that helps control sugar (glucose) levels in the blood. As a result, sugar accumulates in the blood rather than being absorbed, stored or burned for energy. 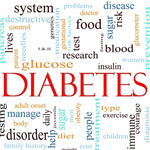 Studies strongly suggest that the type 2 diabetes may be preventable. The Diabetes Prevention Program examined the effect of weight loss and increased exercise on the development of type 2 diabetes among men and women with high blood sugar readings that hadn't yet crossed the line to diabetes. After almost three years, there were 58% fewer cases of diabetes in the group assigned to weight loss and exercise than in the group assigned to usual care. If diagnosed with type 2 diabetes, there are three basic management tools: healthy eating, physical activity, and blood glucose testing. In addition, many people with type 2 diabetes require oral medication, insulin, or both to control their blood glucose levels. Gestational diabetes affects pregnant women and the condition usually disappears after childbirth, but a woman who has had gestational diabetes faces a higher risk of developing type 2 diabetes later in life. The condition can also pose a danger to the unborn child and the mother. The child may be born severely obese, putting him or her at a higher risk of having a dangerously low blood glucose level. There is also a risk of severe breathing problems. Like type 2 diabetes, gestational diabetes is usually controlled through diet. A compound in Green tea has been shown to be effective in the management of diabetes, one study has found. Long prized for its life-lengthening properties in the traditional medicine systems of the Far East, Green tea is made from the unfermented leaves of the tea plant. It contains the highest amounts of polyphenols, which are types of antioxidants that fight free radicals and possibly prevent certain types of diseases. Resveratrol, an antioxidant found in red wine, may also counter type 2 diabetes and insulin resistance, another study shows. It is found in grapes, raspberries, peanuts, and other plants that use resveratrol to defend against threats such as disease. The researchers aren't recommending that anyone rely on wine to help their insulin sensitivity, but the results could be a valuable new strategy for treating insulin resistance and type 2 diabetes. A number of studies have been carried out demonstrating that Gymnema sylvestre helps control both type 1 diabetes and type 2 diabetes. Gymnema has been a well-proven treatment for diabetes for over 2,000 years. The leaves were also used for stomach ailments, constipation, water retention, and liver disease. Gymnema is best known for its apparent ability to lower blood sugar levels when used for an extended period of time. Results from case reports and studies in humans and animals suggest that it may work in several ways to help control both type 1 and type 2 diabetes. It is possible that gymnema sylvestre may even prompt the pancreas to develop more beta cells - the source of insulin. It may also make body cells more responsive to the insulin that is available. Diabetes management is not an easy task. Although natural remedies may not cure your diabetes completely of replace your need for insulin shots or pills, they could possibly help you manage your glucose levels and keep your diabetes under control. Because of the potential for side effects and interactions with medications, dietary supplements should be taken only under the supervision of a knowledgeable health care provider.